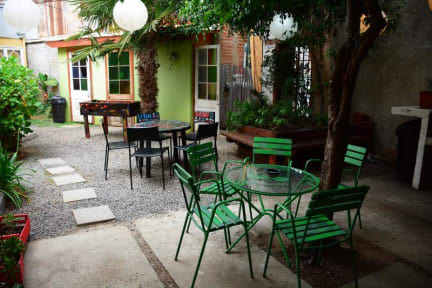 Escarabajo Hostel is the ideal place for people that are looking to explore all that Valparaiso offers and chill out in the best atmosphere. We make this happen by offering comfy rooms and beds and great common areas in a full of art and good energy environment to share with friends and other travelers. Escarabajo Hostel is located in Cerro Bellavista, one of the beautiful hills of Valparaiso, near to the city center and surrounded by attractions such as traditional bars, cultural centers, restaurants, an open-air museum of street art, and is pretty close to one of Pablo Neruda”s famous houses, La Sebastiana. The hostel is easily accessible by walking, colectivo (shared taxi) or bus. In Escarabajo Hostel have comfortable double and shared rooms, all with security lockers, bathroom and shower in the room. The position is very good, close to La Sebastiana (Neruda house) and in the middle of the open air museum. It's safe but is better not to use the stairs during night. The six bed female room was very small, only two power points, far from the beds, not a really comfortable bed. Kitchen and indoor/outdoor common area are really beautiful. I spent two nights there, people is OK, but two young volunteer in my opinion were a little bit too rude.